"When measuring and designing kitchens or cabinetry, you must pay very close attention to detail while implementing your clients' wants and needs. It's the fine points of any design that separate an adequate solution from a truly outstanding one. With my experience, I will continue to focus on the details while maximizing storage potential to make eye appealing, magnificent spaces become a reality. The customer is forever king or queen in my book and will always come first." Don't let this baby face fool you. 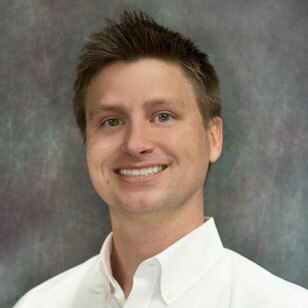 Josh is a veteran designer in cabinetry and space management design. Prior to his arrival at Closet Works, Josh worked one-on-one with clients to design the kitchens and bathrooms of their dreams. For over seven years, he has been helping homeowners maximize their storage potential while creating beautiful cabinetry styles to last a lifetime. 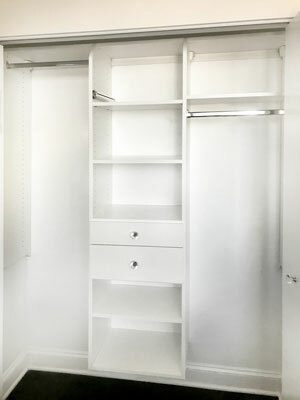 This rich and warm Corretto Cherry guest reach-in closet takes organization to new heights — transforming a standard reach-in closet with a stunning makeover. The use of slanted shelves with shoe fences and double hang on either side maximizes storage in an underestimated space. 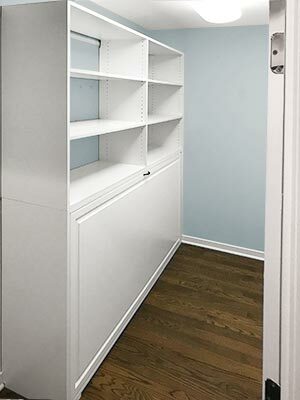 Josh designed this wonderful reach-in closet as baby storage central. 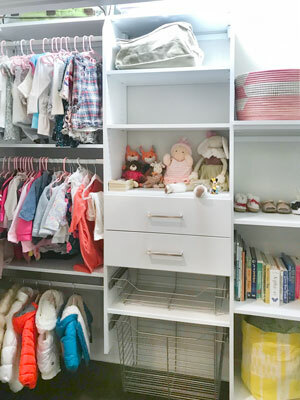 The closet has three clothing rods to hang all of the baby's knits and jackets and the rods and shelving are adjustable to that the hanging length can increase as the baby grows. The design also has convenient baskets for linen and shelving for toys, books, and other nursery belongings. 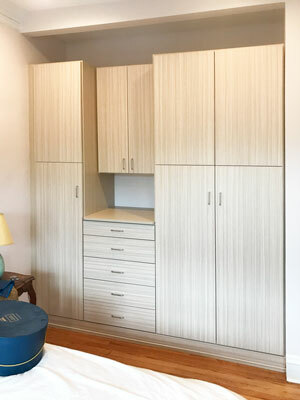 This reach-in closet was cleverly designed with function and style. 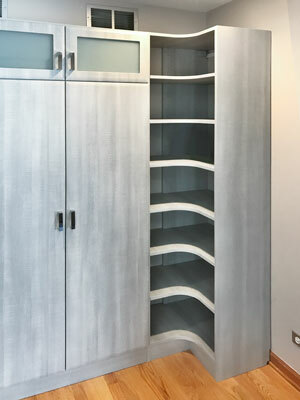 Including features such as a Rain Cloud laminate, brushed chrome Metro handles, and a center wine cube for rolled linens or even a collection of botles — this closet has endless possibilities for storage. 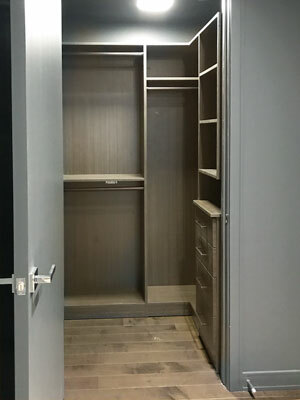 In a shadowy moonlight laminate, this closet has an elegant, relaxing feel as the system completely maximizes use of the space. 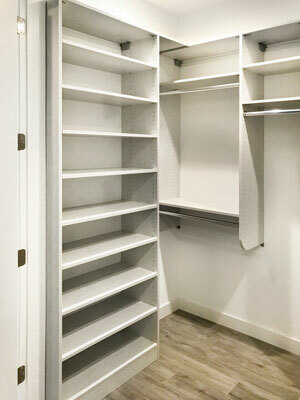 Providing shelving space, drawers, and hanging rods, this closet has all the assets for perfect closet organization. 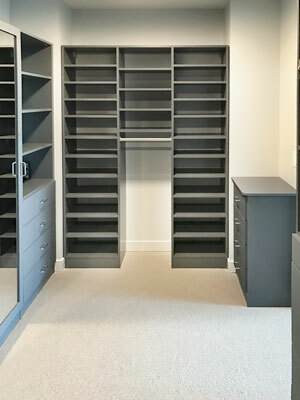 As the counterpart to his Moonlight closet, this walk in closet for her offers extraordinary measures for organization including double hang, long hang, and extensive shelving. A further look into this walk in closet displays a full length mirror — a valuable feature for making sure you're picture perfect before a night on the town. 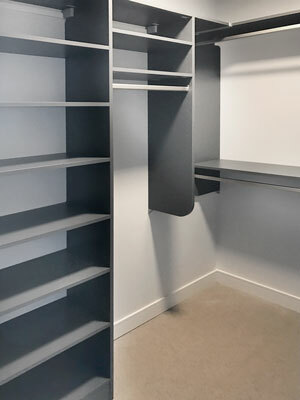 The adjacent wall presents elaborate shelving for shoes and folded items with a modest-sized hanging section situated right in the center. This organization system of adjustable shelves provides storage for all pairs of shoes and folded items. The unit surrounds a perfectly centered hanging rod for blouses and medium length clothing. 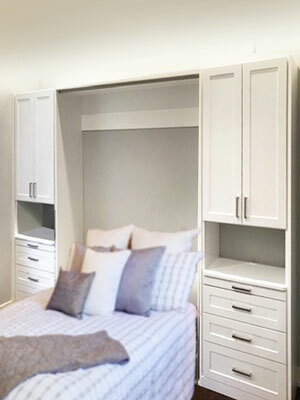 As a bedroom storage and media center solution, this wardrobe offers the room a design that is both functional and charming. The Morning Dew laminate is soft alternative to white, allowing this system to be an accent color in the bedroom. The unit was designed to accommodate a large television with a soundbar attached. The tonality of the warm cocoa laminate with the neutral beige walls creates a very exquisite and inviting treasure trove for her. The organization system is suspended and carefully planned to allow access to the each of the vents of the room. 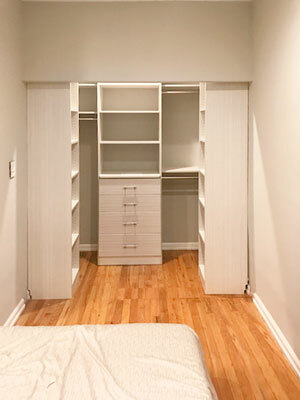 With attention to the unique dimensions of this room, this suspended walk in closet system was designed as a solution to completely maximize the difficult space. 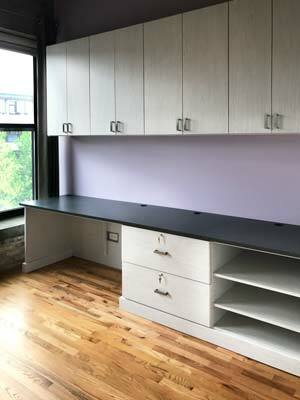 The organization system offers double hang, shelving, drawers, and additional hanging space on the opposing wall. 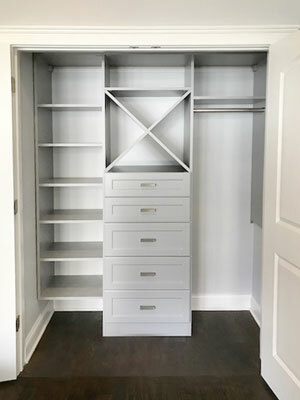 This simple reach in closet has been customized as an organization system for evening wear — offering elongated hanging compartments for gowns and formal wear. The crystal knobs add a sparkle of uniqueness and charm to the white closet. The addition of a valet pole allows you to hang dresses separately before wearing them out for a fancy date or special private event. 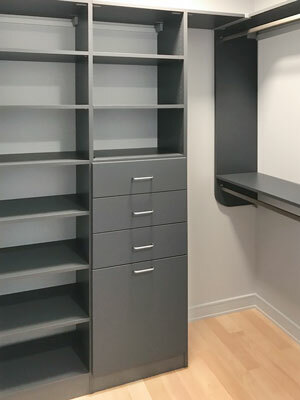 This reach in closet is a great demonstration how a standard reach in closet can be elevated and transformed to have a distinguished aethestic and specialized function. 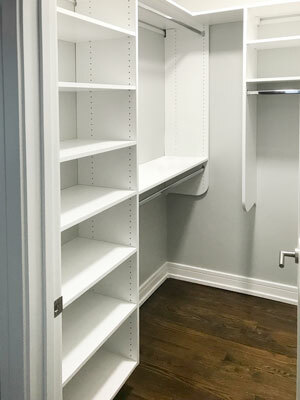 By implementing a unique Breakwater laminate, elegant Emerald knobs, and providing a pull-out shelf closet accessory, this reach in closet is one-of-a-kind. Many people underestimate small spaces not knowing how much potential for organization there really is. 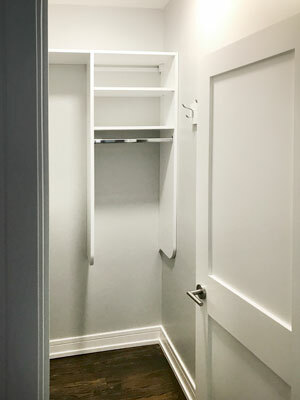 This walk in closet is an example of maximizing a small and narrow space with a closet system — tending to wardrobe storage needs with strategically placed hanging rods and shelving. 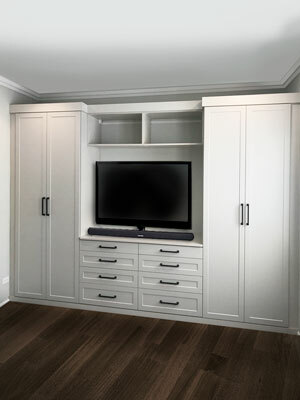 A custom closet can be personalized to your specific storage needs no matter how big, or small. 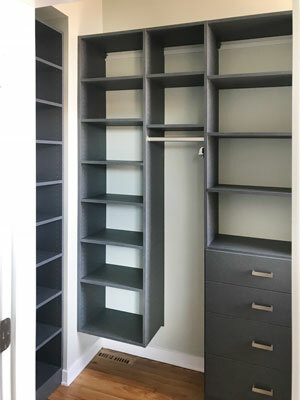 This walk in closet impressively includes both double hang and long hang, shelving, and even a cleat with hooks. 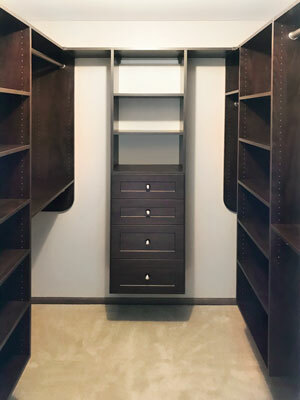 This closet is in a Spring Blossom laminate with oil rubbed bronze Square hardware. The small walk in has an earthy aesthetic and provides expansive storage using double hang, long hang, drawes, and a variety of shelves for folded garments. 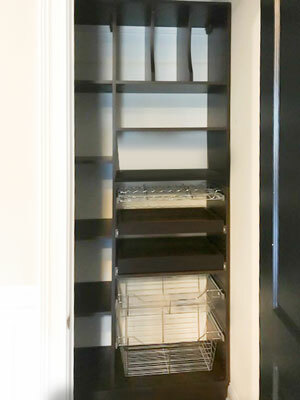 This reach in closet organization system has been created with a Cocoa laminate and offers far more organization than any standard guest reach-in closet could offer. 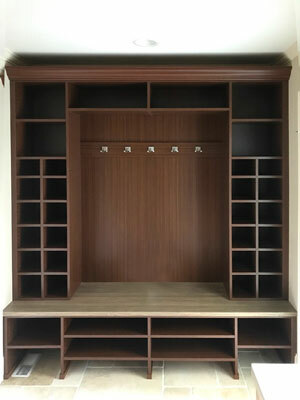 The system includes hanging, drawers, and an array of shelves for shoes and various folded items. 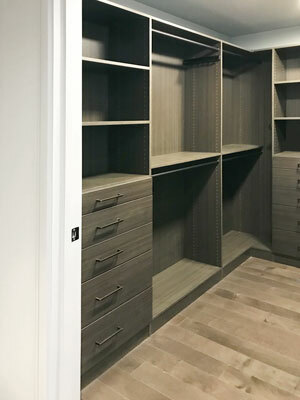 As a corresponding closet to a smaller walk in, this master closet uses the same earthy attributes with Spring Blossom laminate and oil rubbed bronze hardware while providing spacious measures for maximum organization with two double hang sections, two sets of drawers, and wide shelves. 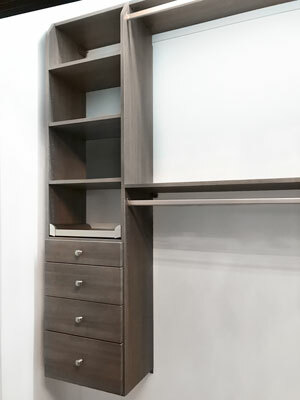 This suspended design provides an array of shelving units to organize folded clothing and shoes in a sleek, Chino laminate. Metro brushed chrome handles offer a modern and clean aesthetic for the entire sleek closet. A Separate shelving unit offers organization for a high volume of shoes. 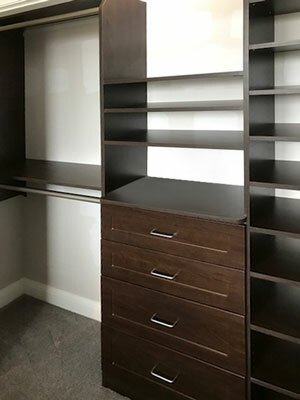 This closet for him offers ammenities for perfect organization including double hang, extensive shoe shelving, and shelves for sweaters and folded items. As a great example of handling a window in a closet, this design offers a smart solution with a window hutch as the perfect space for a pull-out hamper and set of drawers. The light floods in from the window and brightens up the darker Chino laminate. 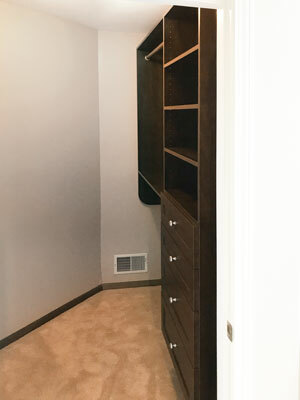 This walk in closet organization system has been masterfully crafted from the careful planning under the sloped ceiling walls to the fine-tuned accessories and rich Cocoa laminate. The Villa door faces are open frame to become beautiful closet mirrors. 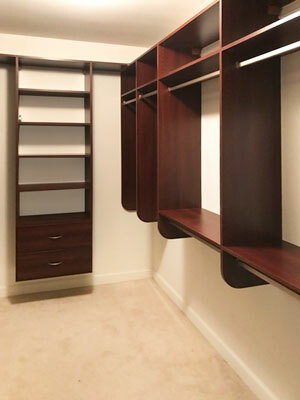 Suspended in a Shiraz Cherry laminate, this walk in design expands the space and provides luxurious storage for all wardrobe organizational needs. With double hang, long hang, shelving, overhead storage, and a set of drawers with beautiful Crescent handles — this closet has been masterfully designed. 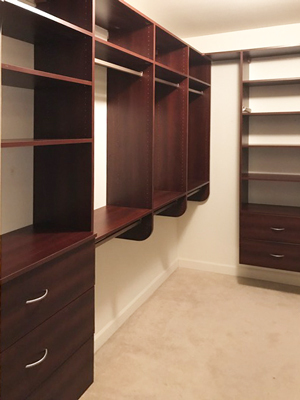 This walk in closet design takes simple elements such as crescent handles and a rich, Shiraz Cherry laminate and transforms the room into an lavish and inviting space. 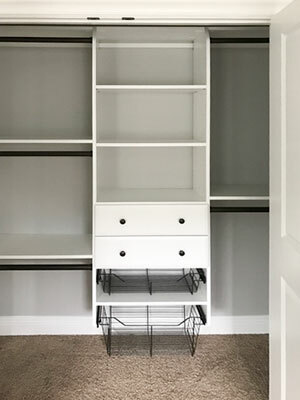 The suspended closet design allows for plenty of storage space below the system and does not interfere with the carpeting. This walk in closet organization system is in a premium Winter Fun! laminate — offering a beautiful and artistic look on top of outstanding function. 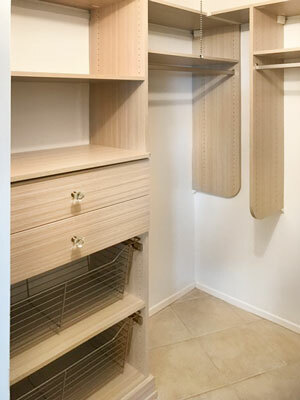 The closet design has both double hang, long hang, and a generous shelving section for a large amount of shoes. Along with hanging and shelving, this Winter Fun! 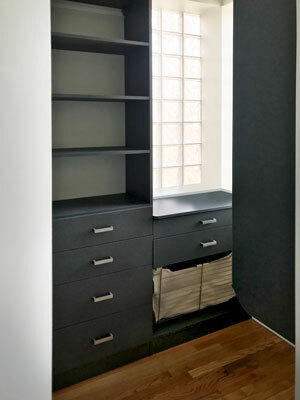 walk in offers a bank of drawers as a built-in closet dresser. Items can be folded away in the spacious drawers as well as on the surplus of shelves. This walk in closet offers plenty of perks for perfect organization. 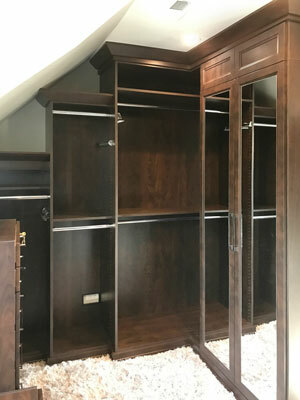 Not only does the soft, Cocoa Bean laminate give this walk in closet a unique look, the features such as double hang, shoe shelves, a built in closet hutch dresser, and closet accessories make this a truly noteworthy organization system transformation. 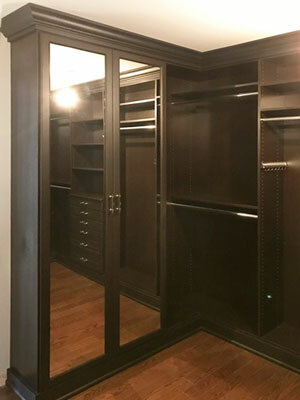 This custom walk in is in an elegant, dark Libretti laminate and has special accessories that perfect this closet and make it a personal haven. 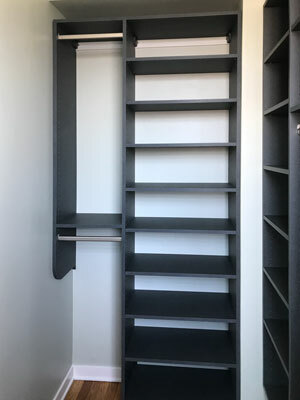 Slanted shelves with shoe fences are a stand-out way to keep footwear organized and the chrome shoe fences are a beautiful contrast to the dark laminate. A motorized pull-down rod is a brilliant solution to maximizing the height of your closet but still having easy access to higher items. A further look into this walk in closet and it simply gets more and more beautiful. Open frame doors hold mirrored inserts to add a sense of opulance, textural contrast, and be the last stop to make sure you're looking your best before a night on the town. 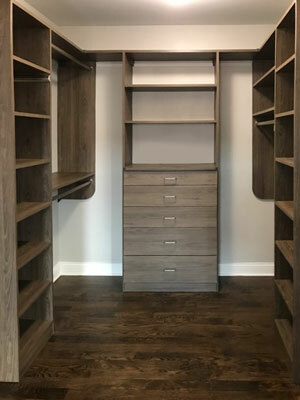 This master bedroom was in need of more storage and what better placement than to build an organization system in the alcove provided in the room. This open floor plan style room welcomed shelving, hanging, and drawers in our White Chocolate laminate. 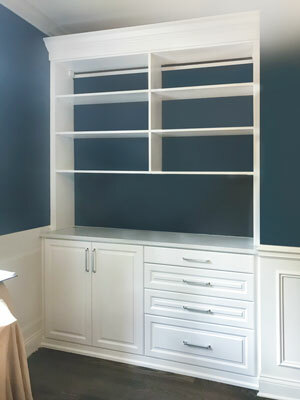 The tall shelving sections stretched up into the alcove offering even further storage space. 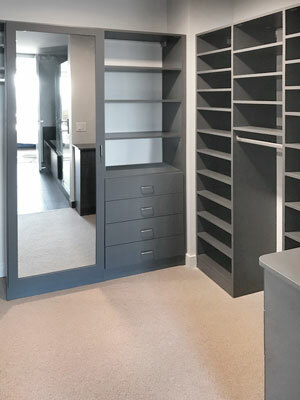 This walk-in closet design was created for an entry closet — adding the perfect organization system this space needed. The light Summer Breeze laminate offers an easy-going look in combination with pull-out baskets for even easier organization. 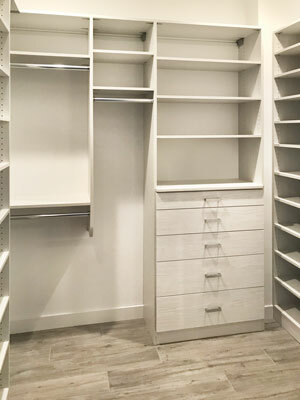 This reach in closet was designed as a baby closet in white with oil rubbed bronze knobs, convenient basket pull-outs, and adjustable rods and shelving. Linens, toys, and clothes all have a proper place in this simple and cute design that can be used for years to come. 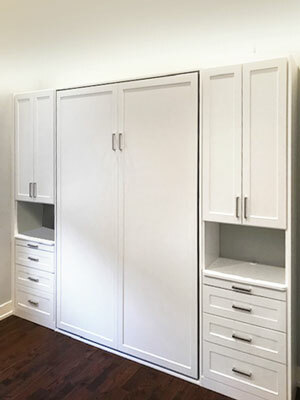 If you live in an apartment or house that just simply does not have enough closet space, this design is a great example of how you can increase your closet storage space with a custom wardrobe. The design is compact but has both style and function in a Summer Breeze laminate and plenty of hanging and drawer space. The doors have also been doweled together to further create an easy-going and simple look. 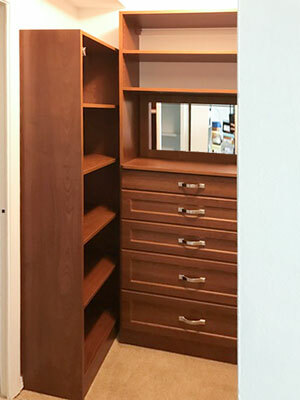 This walk in closet is in a traditional style with Corretto Cherry laminate and Aspen drawer fronts. With expansive shelving and a closet dresser hutch meeting at the corner, the design maximizes the space and does so effortlessly and elegantly. 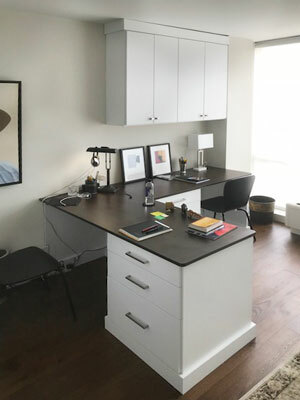 Josh was able to include multiple ways to organize while maximizing the space so the client could have their desired style as well as function. 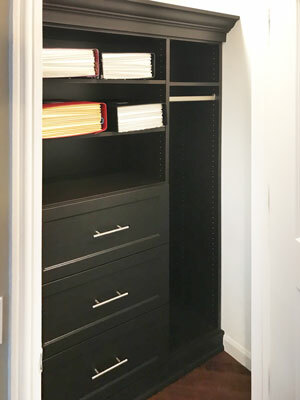 As a reach in closet part of a home office, this closet offers a unique way to keep both paperwork and clothing organized. The sophisticated, dark design is in a Libretti laminate and provides spacious file drawers, shelving, and also a hanging section for any work clothes that need a special place to go. 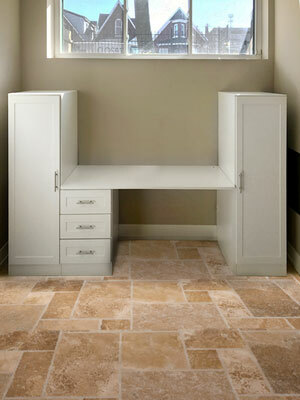 This mudroom organization system is designed with premier style and outstanding functionality. The unit is constructed in a River Rock laminate with Italia faces. The Italia doors have been customized to accept white lami glass inserts. As an innovative feature, curved shelves maximize the shelf space for plenty pairs of shoes, boots, and additional entryway storage. A cleat with six chrome double hooks provides hanging space for twelve or more jackets, hats, and bags. The cleat is elegantly concealed behind Italia cabinet doors to always ensure an clutter-free sight. 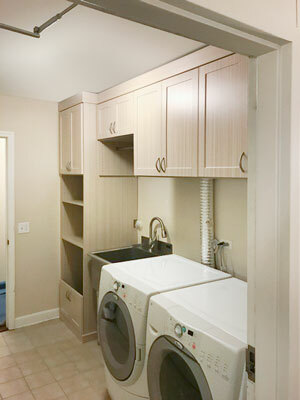 With the added cabinetry and shelving, this laundry room has been enhanced to maximize efficiency. 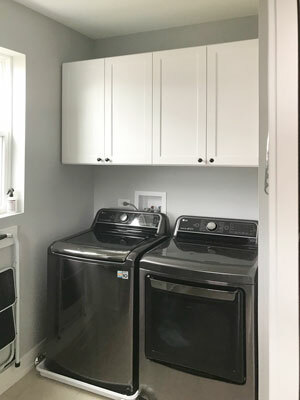 The Moonlight laminate blends well with the washer and dryer creating a very industrial zone for this part of the house. 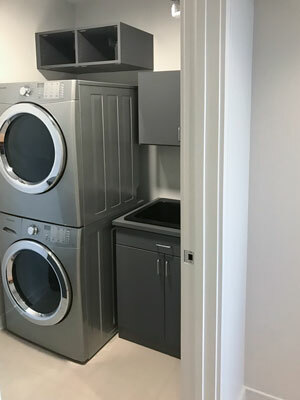 The simplicity of the cabinets above the machines offer a minimalistic look and become the perfect place to keep detergent and chemicals out of harm's way. Laundry room cabinets create a world of difference for keeping this part of the home organized. With everything in its proper place, the workflow of laundry will be smoother than ever before. A special Moonlight countertop has a cut-out for the dark wash sink — adhering to a sleek, dark color palette. 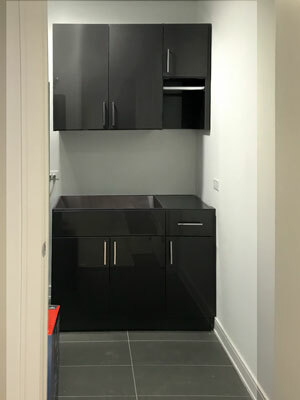 These high gloss laundry cabinets are a sleek, lustrous option to create a modern space with Carbon black laminate with chrome Square handles. The design offers elevated cabinets for detergent, a hanging rod to hang delicate garments, and is designed to accommodate a large wash sink. This laundry room is in a light Summer Breeze laminate for an ultra uplifting and bright atmosphere in the home to complete chores. 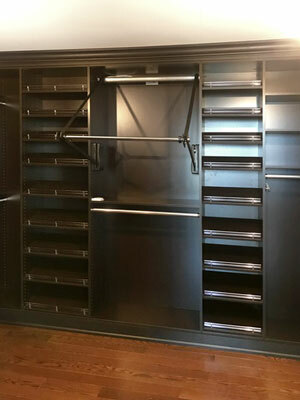 The safe, out of reach cabinet systems have been customized to perfection in order to accommodate the features in the room such as interior notches for the exhaust to travel through. 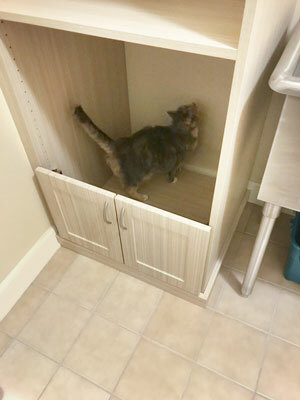 A special section was catered for kitty — an alcove without shelves to be used as a litter box cabinet. A special little passageway was created with a litter box in mind. Shelves have been omitted to keep this as a spacious alcove to keep litter mess under control and have our feline friend able to travel in and out of this spot easily. Aside from an inherent beauty of this design with its colorful Autumn Leaves laminate, this mud room has impressive construction details to keep the entire family organized for years to come. 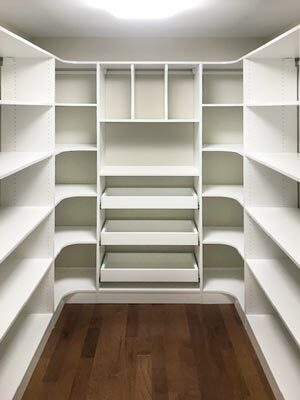 The design offers shoe cubbies on both sides, a cleat with hooks for jackets and bags, and shelving above and below for additional items. An added elegant accent piece to this unit is the Apres Ski bench countertop. The difference a simple organization system can make is sometimes unbelievable — making you wonder how you went for so long without one. Suspended cabinets such as this set of white Shaker Mission cabinets transformed this laundry room into a clean, efficient, and elegant center in the home. This home office design is not only sharp and stylish, but functional in a number of ways. The design provides a spacious countertop, wide, locking file drawers along with the expansive cabinets suspended above for supply storage. A Winter Fun! laminate is the primary color with an accent of a dark Chino countertop. All of these style elements along with the Metro handles create a cool and contemporary home office design. 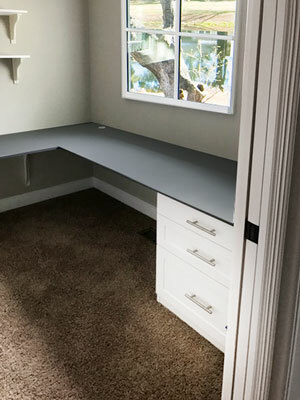 Basements can be cold and cramped areas but fortunately in this room there was a window to let the sunshine in and shed light on a beautiful, white desk design that will be a toddler's craft space. The balanced cabinets on either side will hold games, toys, and coloring supplies. This stylish home office design was conveniently constructed for two with double the desktops and storage cabinets to share. The design is contemporary with Contempo door fronts, chrome Square handles, and a Cocoa countertop for an elegant contrast. Wires can travel through the unit easily by going through grommets and outlets left accessible. With stylish modern elements such as a Moonlight countertop and Bar brushed chrome handles, this desk bridges the gap between fashion and functionality. The spacious desk top wraps around the corner of the room — maximizing the workspace and allowing room for additional things such as a desk light or a printer. This home office wall unit cabinet and drawer organization system has been created with elegant Harmony doors and comes with accessories and details for maximum efficiency and storage. 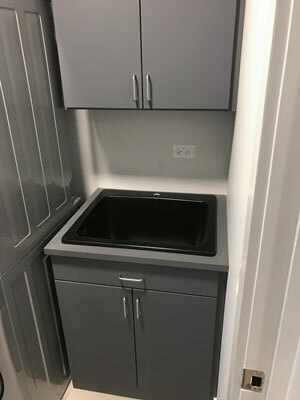 The cabinet doors contain organization bonuses including a roll-out shelf for a printer, scalloped edges for wires to easily pass through, and file drawers. This bed folds down from a relatively small, narrow storage space. Its compact design makes it perfect for adding aseparate sleeping space to a small studio apartment. I could also work as a private guest quarters for a home that doesn't have a separate guest room. The bed hides completely away to allow for more room in the closet. 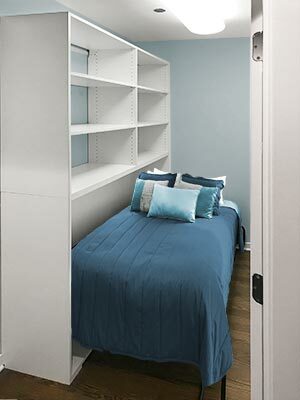 The horizontal design of this Murphy bed is very effective in this narrow space. This elegant wall bed unit is a vertical Queen-sized design with Shaker style cabinets. Perfect for a small guest room, an outstanding feature of this design that it is only 16 inches deep when folded up! The compact design folds out to a beautiful and spacious bed for you or your guests. Bedside shelving, drawers and cabinets make it convenient to put any items away before peacefully falling asleep. 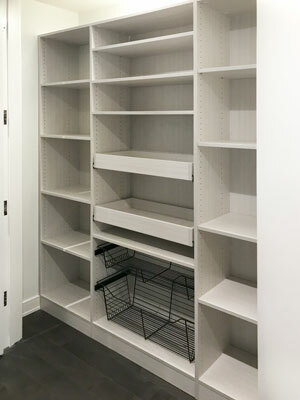 This pantry organization system offers customized features to particular storage needs including wire baskets for vegetables, vertical dividers for trays, and corner shelves that intersect to maximize space for all dry goods. 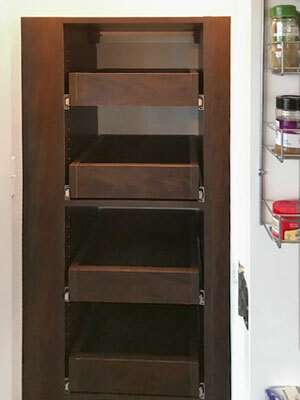 The Moonlight laminate gives this pantry an elegant and shadowy look resembling a mysterious cavern. The expansive nature of this design creates seemingly unlimited storage space. The arrangement has been perfected with curved shelves for maximum storage for all pantry goods. Convenient pull-outs make it easy to grab favorite snacks or other frequently used items. Vertical dividers at the top offer space to organize large trays so they can be neatly stacked. 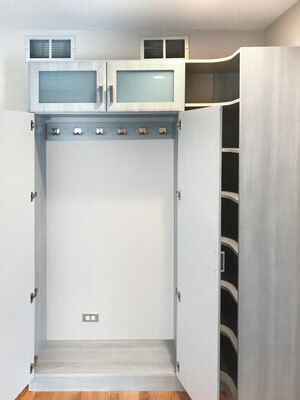 This polished pantry design has an expansive layout for maximum organization. Perfectly centered pull-out shelves offer easy access to frequented snacks. In a white chocolate laminate with oil rubbed bronze baskets, this pantry design offers a stylish look along with its functionality. A goal of this design was to see how much storage a small space can really hold while still looking sharp. 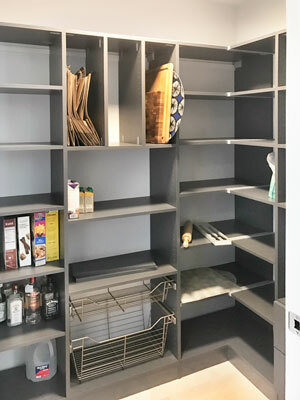 This aim was accomplished by using a rich Cocoa laminate and several pull-out shelves — truly expanding the space and making organization more efficient by not having to reach far back to grab items. As a small pantry closet, Josh designed this space to be completely transformed for maximum organization with a variety of customizations. 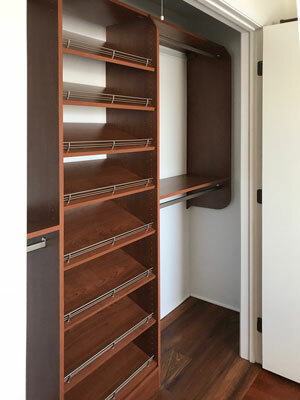 The Cocoa laminate pantry has efficient accessories such as pull-out shelves, a spice rack, wire baskets, vertical tray dividers, and also curved shelves for increased shelf space. 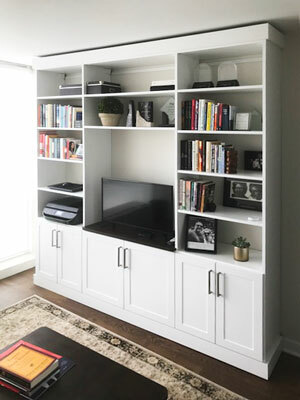 Situated on a home office wall, this media center offers bookshelves, a spot for the television, and provides storage for office supplies and more. The beautiful white wall unit has Shaker Mission style doors with Square handles for a transitional look that becomes the perfect canvas for a variety of decor to be displayed on the shelves. 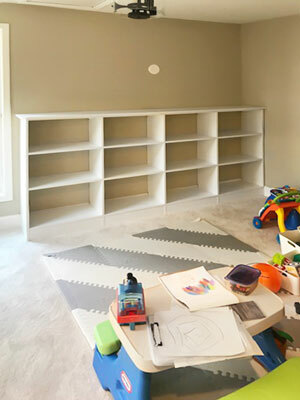 Creating an ease of cleaning up after playtime, these spacious shelves are a wonderful addition to the playroom. Offering 12 expansive compartments, toys and games can all be organized in baskets or directly on the shelves. 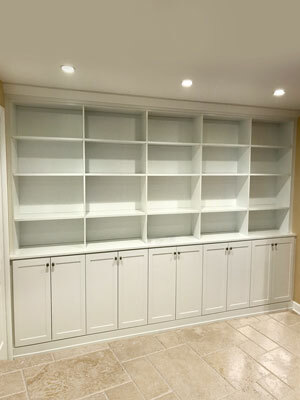 As an addition to a lower level part of a home, this beautiful built-in becomes the family's very own library. The expansive design spans the wall with varied shelving for an array of different sized books and mementos to display. The simple addition of Emerald style knobs with Shaker Mission doors create a timeless, transitional aesthetic.